If you love your bagels soft on the inside but crunchy on the outside, your toast perfectly browned every time, or your frozen waffles cooked through, we have the setting for you. 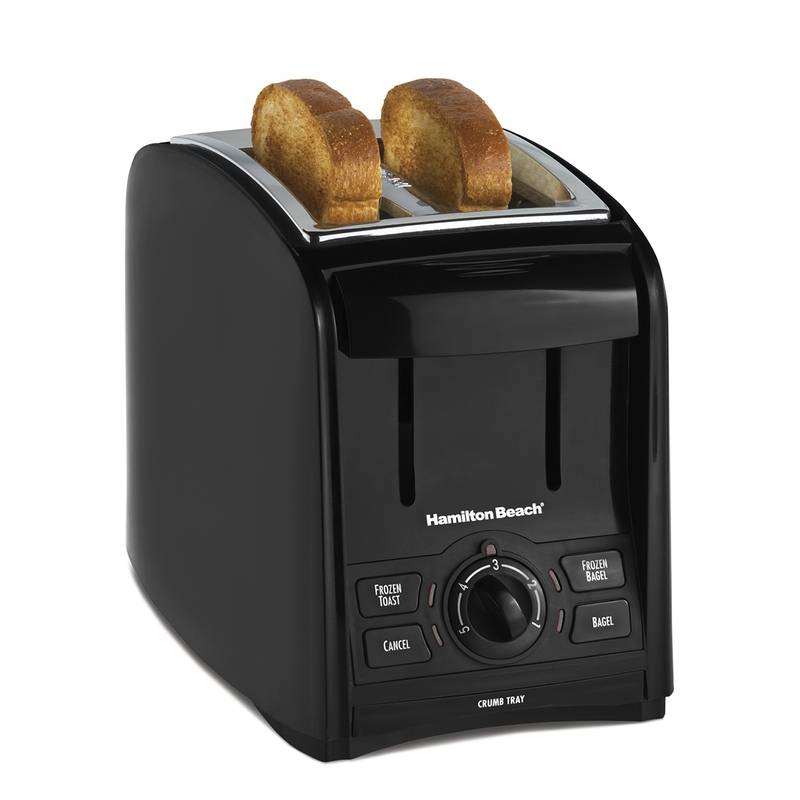 With the Hamilton Beach® PerfectToast 2 Slice Toaster, you’ll have wonderful results every time. With several toasting functions, and a browning dial you can set to your taste, it’s easy to add a bit of crunch to your mornings. The wide 1.5 inch slots are generous enough to fit thick bagels or pieces of artisan bread. Whether you’re toasting a bagel or an English muffin, automatic toast boost helps raise the contents up so they can easily be removed. The Hamilton Beach® PerfectToast 2 Slice Toaster comes in classic black with a simple but sleek design sure to fit in with your other countertop appliances. For safety, it has a cool-touch exterior. A crumb tray slides out from the bottom for easy clean up. From bagels to waffles to toast, the Hamilton Beach® PerfectToast 2 Slice Toaster has what you need to prepare a delicious breakfast. With wide slots and automatic toast boost, this toaster accommodates your morning cravings. Hamilton Beach® 2 Slice Toasters are popular not only for their expert toasting performance -- they also look great in your kitchen. Wider slots and smart buttons allow you to uniformly toast and warm bagels, English muffins and other breads, and advanced toasting technology ensures consistent results with each use.